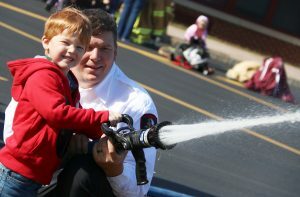 Robbie Ditmar, Fairley pre-kindergarten student, flashes a smile upon successfully operating a fire hose, under the direction of Hannibal Volunteer Fire Department Chief Carl Emmons Jr.
HANNIBAL – Fairley Elementary School’s youngest students were recently given some important homework from members of the Hannibal Volunteer Fire Department: practice fire drills at home. Much like fire drills at school, Chief Carl Emmons Jr. told the four-year-old students practicing fire safety at home just as important. He and firefighter Aaron Ingersoll reviewed important information and potential hazards before they showed firefighting equipment. Emmons even dressed in full gear to show the children that approaching a firefighter with all their gear on isn’t scary. Student Robbie Ditmar showed his classmates how to stop, drop and roll if their clothes catch on fire. Classmate Richard French was ecstatic to try on Emmons’ coat. Several students, under Emmons’ supervision, also practiced using the fire hose. Emmons, who is a member of the Hannibal Central School District Board of Education, said all grade levels will receive fire prevention education throughout the 2018-19 school year. The pre-kindergarten lesson just happened to occur during October as National Fire Prevention Month.